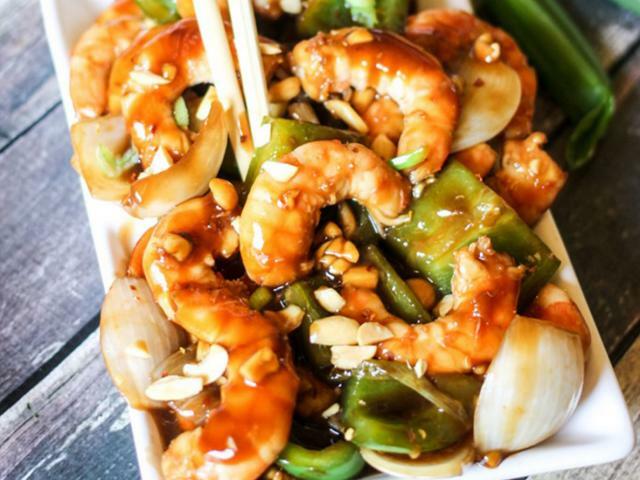 The flavours that feature in this Asian-inspired shrimp dish work best when they’re all thrown together. Working with all these ingredients in one just pan makes the cooking part easy, but the delicious results will have you feeling like a professional chef. In a large wok, add 1 tsp sesame oil, and heat over medium heat. Add ginger, garlic, red pepper flakes; stir to coat. Add onion, green pepper, and green onions; sauté for 4-5 minutes. Add shrimp and peanuts, sauté for 2 more minutes. In a bowl, add all ingredients for the sauce and whisk well to combine. Pour sauce into skillet, turn heat to high, and stir to coat. Simmer for 30-60 seconds, or until sauce has thickened.